The vote is in... and May has lost by a 149 vote margin - 391-242. "I profoundly regret the decision this house has taken tonight"
Another 3-digit defeat. While the Jan. 15 loss was the biggest ever, at least May can argue this is only the biggest in 2 months. "This is an issue of grave importance for the future of our country," May says, as she says the vote tomorrow on whether to accept or reject a no-deal Brexit will be a free vote. May then listed a succession of possible choices for the House. When she asks if it wants a second referendum it elicits a chorus of both YES and NO from different corners of the chamber. May says there will, as promised, be a vote tomorrow on a no-deal Brexit and a vote on Thursday on delaying Brexit, which consensus now sees as failing and resulting in a vote to extend the Brexit process, although whether and how that happens remains to be seen. If MPs vote to extend the Article 50 process, in addition to the UK’s approval, every EU member would be required to agree. The message from the EU has been mixed; while some think it is a sensible idea, others say the process should only be extended if there is a good reason for it. Assuming that the EU agrees, the process could be pushed from the UK’s current Brexit leave date 29 March, to 18 April – the last day that the European Parliament can vote before breaking up ahead of May’s elections; the European Parliament has yet to even debate the Brexit deal, and has therefore not yet voted on it. It is likely, however, that if the UK votes for what is available, EU lawmakers will likely follow suit. The current exit date is enshrined into UK law, and that would need to be changed; BBC says a push to 23 May has emerged as a possible new Brexit day to allow the UK two months to fully prepare itself for leaving, and this would also mean the UK departs ahead of the 23-26 May European Parliament elections. IF no agreement between the UK and EU on the backstop is seen, a longer delay to exit become possible. A push to the end of June – 23rd is capturing imagines since it would coincide with the Brexit referendum anniversary – would be an admission that more time is needed, though new MEPs take their place in Parliament in early July, suggesting that nothing could be voted on until then at the very earliest, a scenario that not be ideal for either UK or EU. If the process cannot be wrapped up by July, then scenarios of 2021 come into focus (EU officials are said to have mulled a delay until then, BBC reported), though this may not be palatable for Brexiteers, and thus, may split the government and lead to another strategy before then. Nearly three hours after the voting began, the results of the indicative vote are finally in, and it looks like MPs rejected every single alternative to May's Brexit deal that was included on the ballot. That's right, not a single option received enough votes to pass by a simple majority. So much for the hopes expressed by Oliver Letwin, the mastermind behind the vote, who had said it would at least help narrow the options down...but that didn't stop him from proposing that Parliament should vote again on Monday to "reconsider these matters." Brilliant to hear a whole range of new Brexit options that MPs don’t want. Truly illuminating. ...Twitter wits couldn't help but crack a few well deserved jokes. For what it's worth, a proposal to keep the UK in the customs union and a plan for a second "confirmatory" referendum on May's deal came the closest. The fact that MPs have no idea what they want has never been more clear. We wonder if this will make May's "back me then sack me" offer any more attractive to intransigent Brexiteers, and, possibly the opposition? Theresa May will resign before the next stage of Brexit. BREXIT means Britain must exit European Union ?? Prime minister "May" wants to England to leave European Union ?? Theresa May is set to push ahead with a critical vote on part of her Brexit deal after overcoming the speaker’s ban on repeatedly putting the same plan to MPs. Commons leader Andrea Leadsom confirmed on Thursday that the government will exclude the political declaration, which deals with Britain’s future relations with the EU, in Friday’s vote - focusing solely on the withdrawal agreement. The withdrawal agreement and the political declaration together form Theresa May's Brexit deal. The EU has said the prime minister needs to secure approval by 11pm UK time on Friday for the withdrawal agreement - not the political declaration - if the UK is to be given an automatic delay of its departure date from the bloc until 22 May. Otherwise, Britain has until 12 April to announce a new plan or leave the bloc without a deal. The announcement came as Downing Street made a last push to win over Tory rebels and the DUP to her Brexit deal after offering to quit before the next stage of talks. There is still substantial opposition to the agreement, even after the prime minister sacrificed her job for her deal, promising to quit if MPs approved the agreement and let Britain leave the EU on schedule in May. Jeremy Corbyn and Theresa May spoke for 20 minutes on Thursday evening and the Labour leader said his MPs would not back the Government move. "Jeremy made clear Labour will not agree a blindfold Brexit to force through Theresa May's damaging deal, which would leave the next Tory party leader free to rip up essential rights and protections and undermine jobs and living standards," a Labour spokesperson said. It is understood that the call took place at the prime minister's request. DUP deputy leader Nigel Dodds also said on Thursday evening that his party would not vote for the withdrawal agreement on Friday, due to concerns over the backstop. Despite a last-minute round of defections from some Labour MPs and Tory Brexiteers, what reporters jokingly referred to as "meaningful vote 2.5" - the third vote on May's withdrawal agreement - has been defeated 344-286, a margin of about 60 votes. In a speech after the result, May raised the possibility of new elections. The pound tumbled on the results. "We are reaching the end of this process in this House," May said. One way out would be holding another election. Indicating that she isn't planning to resign, the prime minister said she would "continue to press the case for an orderly Brexit. 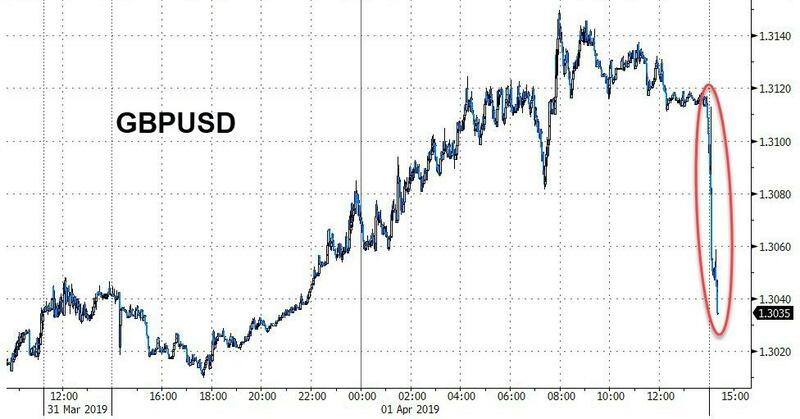 Unsurprisingly, the pound plunged as the defeat has raised the likelihood that the UK will leave the EU without a deal on April 12. In a statement, Deputy ERG Chairman Steve Baker insisted that this must be the final defeat for May's withdrawal deal, and that the Commons must now move on and find another way - or, presumably, accept a 'no deal' exit. "It's finished and we must move on. It has not passed and it will not pass," he added. While Friday's defeat is yet another major setback for the prime minister, who will now presumably push for a much longer Article 50 extension that could last for months or even years, the margin was better than the last two votes, indicating that May has made progress - just not enough to finally deliver Brexit. What will happen next? Well - and stop us if you've heard this before - that's difficult to say. Liam Fox, a senior cabinet minister, said a defeat for the deal could lead to a lengthy Brexit day delay. Perhaps months, perhaps even years. The prospect for a general election has risen. Others will point out that, though no alternative received a majority favorable vote, holding another "confirmatory" referendum on Brexit was among the more popular options during this week's indicative vote. The EU negotiators released a statement saying they were "disappointed" by the outcome of the vote. The bloc has insisted that it will not yield on the withdrawal agreement, and bureaucrats have said they will not accept a lengthy delay of Brexit because that would create complications for the upcoming European Parliamentary elections. Ahead of an emergency summit set for April 10, the EU is reportedly looking to hear in advance what the UK's plan will be. Two options appear to be one the table: Leave with no-deal or get a long extension at least until the end of the year. But at their summit last week, European leaders suggested they were becoming more comfortable with the prospect of no-deal. This issue would have been solved long ago if they had planned for multiple referendum votes instead of just one. Last edited by TheTexan; 03-29-2019 at 09:06 PM. So far, 1 referendum vote, 3 "Meaningful Votes" (is there any other type? ), countless "Indicative Votes", god knows how many opinion polls, with a MV4 vote, a 2nd referendum vote, and/or a general election vote on the horizon. I'm having a votegasm just thinking about it. Last edited by TheTexan; 03-29-2019 at 09:18 PM. So far, 1 referendum vote, 3 "Meaningful Votes" (is there any other type? ), countless "Indicative Votes", god knows how many opinion polls, with a 2nd referendum vote and/or a general election vote on the horizon. Just think how much voting we could have if we split up the US. Even more voting if we stretch out the process for years and years until eventually nothing comes of it! think of all the jobs created for people to count hanging chad. Tory MPs are warning Theresa May that they will resist any attempt to hold a snap general election to try to break the Brexit crisis engulfing the party. Mrs May’s aides are said to be at loggerheads this weekend over whether to accept a soft Brexit or call a general election. Her team want to put her Brexit deal back to the Commons for a fourth vote early this week and if it fails again, some of her most senior aides are pushing for her to call a snap poll. Brexiteer cabinet ministers are reportedly poised to resign if Mrs May accepted a soft Brexit involving a customs union or a long delay to the EU exit which involves taking part in the European elections. One-hundred-and-seventy MPs and ministers have signed a letter urging the PM to secure a swift departure from the EU and pursue a no-deal exit rather than accept a soft Brexit. But at least six cabinet ministers in the Remain camp are prepared to quit if she allows the UK to crash out of the EU without a deal, according to the Sunday Times. 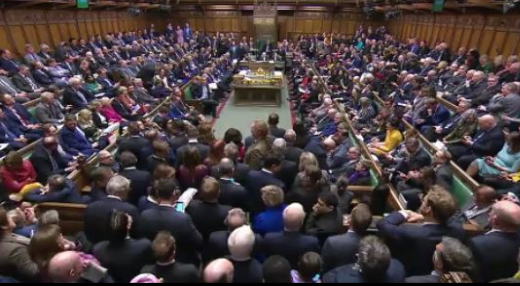 After MPs rejected Mrs May’s deal again on Friday by 58 votes, the PM said there would be "grave" implications and, in a hint at a general election, warned they were "reaching the limits of this process in this House". Mrs May would effectively be a lame duck leader - having said she will stand down once she has got Brexit through - and voters would be voting "blind" not knowing who her successor would be. Foreign Office minister Sir Alan Duncan told The Observer: "If we have a general election before Brexit is resolved, it will only make things worse." Pro-EU backbencher Antoinette Sandbach, who backs a second referendum, told The Observer: "The answer is not a general election, and I would vote against that. We need to find a way forward in Parliament." Her comments were echoed by Mark Francois, the deputy chairman of the pro-Brexit European Research Group, who told the paper there was "not a chance" MPs would back an election under her leadership. "Of course they wouldn't - not after last time. And remember, she needs a super majority to do it," he said. "I don't believe the Cabinet would allow her to do it," he told the paper. "Theresa May cannot call an election, she cannot be the leader who would lead us into it. The party would not tolerate it." Conservative Party chairman Brandon Lewis confirmed the existence of the letter, saying: "I haven't signed the letter. I do know about it." Despite some rumors that the Nick Boles proposed Common Market 2.0 might garner a majority of votes with some Tory remainers and the SNP supporting it and Labour deciding to whip for it, once again, all four of the options tabled in Monday's indicative vote - the second in less than a week - have been rejected. The question now is: Will the Commons give up on indicative votes after this? Or continue trudging ahead as the April 12 deadline looms. 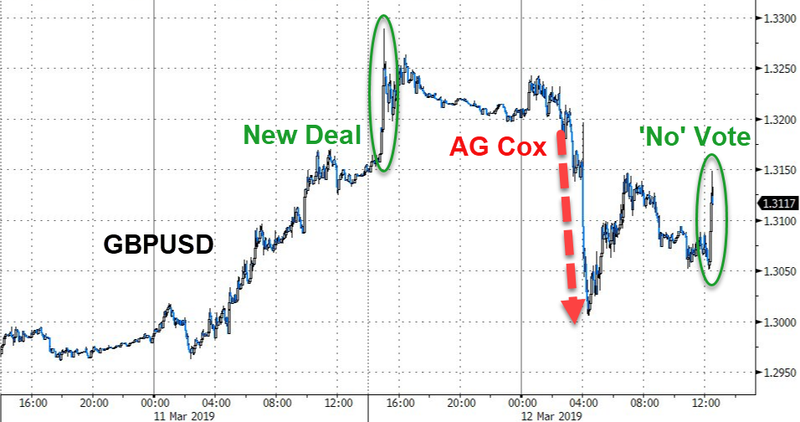 Cable tumbled on the headline as hopes for a consensus around a 'softer' Brexit have been dashed, once again reversing the prior session's gains as the currency continues to violently see-saw with every new development in the interminable Brexit saga. Ironically, as one Tory MP pointed out, the PM's deal got more votes last week than any of the proposed alternatives on Monday. As one twitter wit pointed out, the vote still failed to produce a majority for any one proposal despite cutting the number of proposals in half (there were four on Monday compared with eight during Wednesday's vote), and including both the customs union proposal and the "common market 2.0". So even stacking the deck - still no majority for anything. In the first sign that the results of this vote will lead to even more instability and infighting in the Commons, at a time when more than 200 Tory MPs have reportedly signed a letter supporting a "managed" no-deal Brexit (despite the EU already having poured cold water on that option), Tory MP Nick Boles, who tabled the "Common Market 2.0" proposal, has resigned the Tory whip and will refuse to sits on the Commons as a Conservative, per the FT.
Nick Boles, a Tory MP who brought forward one of the options tonight, says he has given everything to try and find a way forward, but he accepts he has failed. That is chiefly because his party refuses to compromise so he can no longer sit with this party. He is crossing the floor to sit with the Opposition. MPs gasp as he rises to walk across the floor of the Commons. The DUP has confirmed that all 10 of its MPs voted against each of the proposals. Nigel Dodds, the DUP leader in Westminster, said the only proposal that could feasible garner a majority of support is the Brady Amendment - which was essentially a proposal to replace the Irish Backstop with a nebulous, unicorn-like promise to work something out. The EU has said time and time again that it won't accept any changes to the backstop, yet the DUP persists. Ken Clarke, a. pro-European Tory who proposed the Customs Union plan, said his plan didn't get a majority because some people’s vote supporters would not back it because they only wanted to back a second referendum. Others wouldn't back it because they really wanted Common Market 2.0, even though they probably would have been happy with his plan, too. He added, with a touch of dry wit, that sometimes he thinks the Commons isn't very good at politics. In any event, while Theresa May had again threatened to call another general election earlier, threats that the Commons apparently hasn't taken very seriously, it's likely that she will soon be forced to write to the EU to request another extension. Tories have continued to vent their intense anger at Theresa May over her decision to meet with Jeremy Corbyn for talks over the Brexit deadlock. Two ministers quit in protest today with a host of Tory MPs also speaking out. One, Caroline Johnson, highlighted what she called “the risk of letting down the country and ushering in a Marxist, anti-Semite-led government”. Mrs May said on Tuesday that she would seek an extension beyond next week to allow negotiations with the Labour leader aimed at getting a Brexit deal through Parliament. Mr Corbyn said he would be “very happy” to meet the Prime Minister in a bid to offer “certainty and security” to the British people – but Tory Brexiteers have reacted with anger. Mr Corbyn said his demands in Brexit talks would be a customs union with the EU and access to markets, as well as protecting consumer and environmental standards and workers’ rights and guaranteeing the Good Friday Agreement. However, he stopped short of demanding a second referendum, despite huge pressure from MPs in his own party. Brexit Secretary Stephen Barclay admitted today that another Brexit vote is an option on the table in the talks between two leaders. 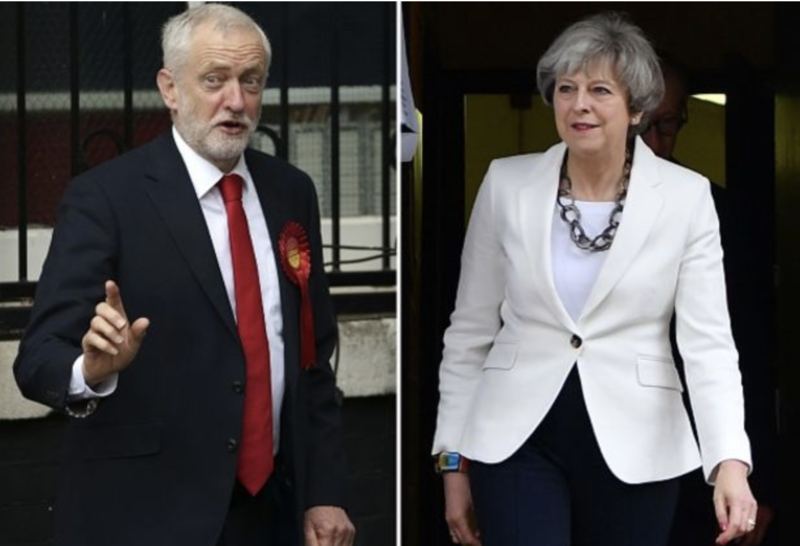 Mrs May met Mr Corbyn on Wednesday afternoon before holding talks with Nicola Sturgeon, who warned that she wasn’t “entirely clear” where the PM was prepared to compromise. Eurosceptic Tories said that the PM “has f***** us” for seeking a softer Brexit with the Labour leader. They added: “She is getting this through off the back of opposition votes. What is the point of being the government? Nigel Adams, the minister for Wales and the Government Whip this morning resigned in what he fears will be a “failure” to deliver Brexit. He said that a deal “cooked up with a Marxist” was now seen as better than no deal. Junior Brexit minister Chris Heaton-Harris also resigned over Theresa May’s handling of Brexit, setting out his support for a no-deal Brexit. Labour has poured cold water on finalising a quick Brexit deal with Theresa May within days, insisting any changes would have to be “legally-binding”. Downing Street has hinted it wants an agreement with Jeremy Corbyn nailed down by the end of the week, in order to meet the EU’s deadline for agreeing a further extension to Article 50 at a summit next week. But Rebecca Long-Bailey, Labour’s shadow business secretary, said the party would require any changes enshrined in law – to prevent the prime minister’s successor tearing them up. But she warned that simply putting changes in the political declaration – the framework for a future EU deal – would be unacceptable, because it was only a “gentlemen’s agreement”. “That’s what we need to see – legal protections enshrined in law,” the key ally of Mr Corbyn told BBC Radio 4’s Today programme. “But we also want to see them enshrined at an EU level, so that any subsequent government couldn't roll back on them wantonly. The comments appeared to suggest Labour would demand a reopening of the withdrawal agreement itself – something the EU has repeatedly ruled out. Ms Long-Bailey also refused to say that any Brexit deal agreed with the government would have to be put to the people in a Final Say referendum, despite both Keir Starmer and Tom Watson insisting it must. She said Labour was entering the talks, which will start later today, with “an open mind”, adding: "We're not setting any red lines for these discussions with the prime minister”. On a second referendum, Ms Long-Bailey risked angering many Labour MPs by arguing the party’s support for it in the latest “indicative votes” was “just to move matters ahead”. “The People's Vote didn't satisfy all elements of our conference policy, but we wanted to have that on the table so members could have the opportunity to look at that if they wanted to,” she said. The demand for any cross-party agreement to be “legally-binding” reflects Labour fears that the prime minister’s move is a trap to “dip Jeremy Corbyn’s hands in the blood” of the Brexit deal. If he agrees any compromise that does not include a second referendum, he will face fury from Remain supporters for helping to facilitate Britain’s EU departure. But, if the Labour leader refuses to cut a deal and the process fails, the Tories will accuse him of blocking Brexit and forcing a long Article 50 extension – possibly at an autumn election. The bigger problem imho is that what is mentioned in Hayward's coment. The pro-globalist propaganda tools, as Integrity Initiative, depict everyone, who dares to criticize, or even question, globalist rhetoric, as collaborator, enemy's useful idiot, 5th column etc. For troops, who themselves being heavily brainwashed, it's easy to behave like this. Integrity Initiative said Corbyn is Russian tool and enemy. Then they see him like an enemy. The carefully concealed offices of a covert, British government-backed propaganda mill at the center of an international scandal the mainstream media refuses to touch. This comes on the heels of Theresa May's announcement yesterday where she said she would meet with Corbyn for Brexit talks in an attempt to gain his support for passing her Brexit deal. Immediately many politicians within her own party expressed outraged, "how dare she conduct government business with an anti-semite, Marxist!". The closer it goes towards the General Election (which is very likely soon imo) expect anti-Corbynism hysteria to be whipped up further. Last month in fact Corbyn was not just hit with an egg, but actually some guy punched him in the head with an egg. It's not clear that the EU would accept an(other) extension at this point, since it's not clear that it would do anything but delay the inevitable. IMO, the odds are still on a no deal exit on April 12. Corbyn is a crazy socialist and a remainer, the Russia and Israel propaganda is garbage but that doesn't make him a good choice for PM. Guy Verhofstadt welcomed the Prime Minister's move to meet with Jeremy Corbyn and said it was "good" she was reaching out across party lines to find a compromise to break the Brexit deadlock. Guy Elster‏@guyelster · 5 min. Considering that the EU withdrawal agreement gives such awful terms for the UK and was already was voted down three times in the UK parliament, then if this 'flexible extension' is agreed it seems likely the UK won't be leaving EU for another year at the minimum. Last edited by goldenequity; 04-05-2019 at 07:14 AM. Despite the prime minister's comments about the necessity of working with the opposition to hammer out a Brexit compromise, to hear Labour tell it, May hasn't been willing to cede any ground in the talks.Even stipulations like modifying the political declaration to keep the UK in the customs union - one of Labour's non-negotiable demands - have been rejected by May out of hand. In fact, the prime minister has refused to "come forward" with anything new. That would set her up to give her withdrawal agreement one last run through the Commons. With the possibility of a lengthy Brexit delay hanging over their heads, she just might be able to win over the 25 Brexiteers and DUP members who voted against her during MV3 when she finally brings the deal back for what would be its fourth go. Media SILENCE as massive Brexit Court Battle RAGES! Why don't neocons push a military intervention if UK Parliament ignores the Brexit vote?